Most people have one over-arching reason to visit Madagascar. (Well, most people have no over-arching reason to, but those who visit it do.) Just as trekkers in the Okavango yearn to see lions and elephants in the wild, visitors to the great red island hanker after a glimpse of the proto-primates, the lemurs. Lemurs used to live as far afield as England and France, but after they arrived in Madagascar fifty million years ago they died out everywhere but there. It took the French forty-nine million, nine-hundred and ninety-nine thousand and nine hundred years to get their hands on them again. Jane and I were no different to any other Mad tourists: we wanted to see these animals before they were gone. 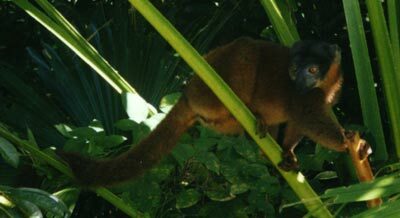 Madagascar's forests, the natural habitat of les lemuriens, are disappearing fast, and the various species are being pushed into smaller and smaller areas of unlogged jungle and scarce reserve. It was one of the most adorable animals I'd ever seen—and I was raised on wallabies. The combined forces of Disney and Hallmark couldn't have concocted a sweeter creature. It was smaller than I'd expected—just a little larger than a cat—and was obviously used to being fed, nibbling away at the banana quite tamely. Jane got up the courage to feed it, but I was wary of its small sharp teeth; after a while, though, I reached out and touched its back, finding the white fur impossibly soft. It's a wonder old Verreaux didn't wipe out the lot to service the fashion industry in 19th century Paris. Maybe he, too, was entranced by them. After we had fed and wondered at the sifakas for a while we moved on, walking around a large marsh towards some trees. Alphonse had spotted a mixed group of sifakas, brown lemurs and ring-tails there. No sooner were we under the trees than a group of the latter had jumped on top of us. Literally. It was a shock, a combination of anxiety—'I've got a wild animal on me'—and excitement—'I've got a wild animal on me!' The ring-tails clambered all over us in search of food, sniffing around our day-packs and pockets. One sat on my shoulder and spread-eagled his arms and legs in classic basking pose. Another climbed onto Jane's head for a better view. Jane carefully took a banana from Alphonse, and held it out to one of the brown lemurs—which immediately snatched it out of her hand. The brown lemurs were less assertive than the ring-tails, but bananas obviously changed the equation. They still wouldn't come too close, though, keeping their distance in the branches and oinking at us, 'Mnnk, mnnk, mnnk,' like a toothless grandfather clearing his throat. We shrugged off our furry baggage and moved on again, to another park-like area of the reserve. Alphonse had found another group of sifakas, which seemed much quieter and more reserved than the ring-tails. He tried to tempt them out of their tree with his last banana. Just as they were getting interested, though, a gang of ring-tails came around the corner behind us and started angling for the fruit. Alphonse laughed, trying to hide it from them behind his back, and then gave up and started to feed them. After a few bites he gave the banana to Jane so that she could have another go. Jane held out the banana, and one, then two lemurs jumped onto her to get closer to it, then three, climbing over her, hanging almost upside down, then four. Well, I thought, why not; she's been fine. I reached out for the stump of banana in her hand. The lemurs watched me carefully. 'The trick is to hold onto it properly,' said Jane. And missed. One of those sharp fangs had gone straight into my index finger. I dropped the fruit, and with it the lemurs. Blood was spreading over my finger. 'Here, show me,' she said, taking a plastic bottle of Eau Vive (purified water) from her daypack and splashing it over the wound. Next to my fingernail was a small red diamond and a ragged flap of skin. 'It is not too serious,' said Alphonse. Well, no, not the bite itself, but—'What about rabies?' I said. Or Jane said. 'It is no problem,' Alphonse assured us. But it was a problem. For anyone from Australia, where neither the wallabies nor any other warm-blooded mammal carries the disease, our complete non-exposure to rabies means that any bite like this is a problem. We spent the next two weeks dealing with it. We saw plenty more lemurs during our trip. At Berenty Reserve we strolled under giant tamarind trees and watched brown lemurs, sifakas and ring-tails dart around their branches. Half-chewed tamarind pods dropped down around us. Our guide warned us not to look up in open-mouthed wonder, for fear that more than tamarind pods would. We saw spiky-haired sifakas dance down Berenty's wide paths like '80s pop-singers who'd discovered flamenco. At dusk we chanced across a family of ring-tails feeding by the side of a path; unlike at Nahampoana, these ones didn't jump onto us and look for food, although they did glance sideways as they strolled past our legs. 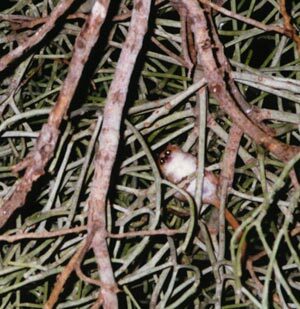 At night we visited Berenty's patch of spiny forest and saw a pygmy mouse lemur, Madagascar's smallest, perched in the Martian tendrils of one of the endemic trees. There were more. At Tana zoo and Ivoloina we saw ruffed lemurs, woolly lemurs, crowned lemurs, and the rare aye-aye—in fact, a 'special aye-aye' (but that's another story). 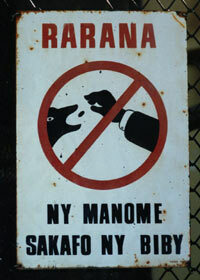 And we saw signs aimed at stupid Australians who've hand-fed too many wallabies. 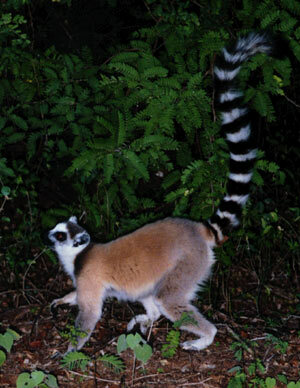 At the end of our trip, at Ranomafana National Park, we saw lemurs as they should be seen: with great difficulty. This large valley of dense jungle is home to grey and golden bamboo lemurs, black Milne-Edwards' sifakas, and red-bellied lemurs, but to see them you have to spend hours tromping through the dense undergrowth in tropical heat. We did, and saw most of the species that live there. 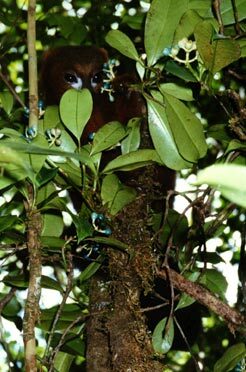 On our second day, far into the jungle, we came across a group of red-bellied lemurs eating small green berries in the trees. One was perched in a branch not two metres from my head. It watched us thoughtfully as it ate. I took its photograph. It was the last lemur we saw in Madagascar. 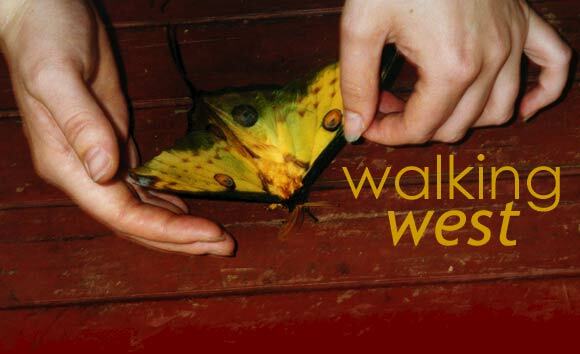 Jane had me bang to rights yesterday when she called this weblog a 'displacement activity'. In recent days, though, the displacement activity has been increasingly displaced by activity. I can't help it, it's just the way my mind works. It wanders around in circles in a seemingly endless warm-up exercise, then sprints madly through a pile of work all at once. Madagascar is one of the poorest countries in the world, which gives its circulated banknotes a distinct character. Five-hundred and one-thousand franc notes are widely used, despite being worth about 8 and 16 US cents respectively. They're the notes the poorest Malagasy (which is most Malagasy) usually see, and so they end up looking like the poorest Malagasy: covered in dirt and grime. Heavily-handled notes are soon coated in a fine layer of mud, and since Malagasy mud is five parts soil to three parts human waste this turns every transaction into a biohazard disposal operation. On the coast, the tropical humidity quickly soaks into the paper to give it a soft, spongy texture, and opportunistic moulds start to eat away at it. Change a large note and you'll end up with a handful of these bacterial swabs rolling around in your pocket like toilet-paper in an S-bend. See for yourself. Brave the 192k download and view the Amazing Changing Banknote—and be thankful the internet doesn't transmit smells. The sound of Melbourne in early summer is the cicada. Drive around the suburbs on a hot day with the window down and hundreds of them will fade in and out in a massed Doppler chorus of white noise. Unfortunate if you happen to live under a tree full of them. M. Night Shyamalan is one of those writer-directors whose films you have to see immediately before anyone can tell you anything about them, because the very subject of the film is part of its effect of unfolding mystery. So it was with Sixth Sense, and so it is with Unbreakable, which I saw last night. Every bit as satisfying as Sixth Sense, if not more so. Don't let anyone tell you anything about it. Just see it. ©2000 Rory Ewins; photos ©2000 Jane & Rory Ewins. Flag images from Flags of the World. 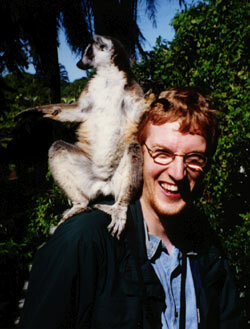 Photo: Ranomafana National Park, Madagascar, August 2000.